All relationships, whether romantic or otherwise, are full of peaks and valleys. Orchards figure might as well put a bright backdrop on the whole thing. Fruits are infallible. They're bright, sweet, bursting with flavor. Note this: candy, the ultimate treat of treats, is manufactured to imitate the taste of fruit. Further, without fruit, we don't have the apple, the ending and beginning of all symbolism. 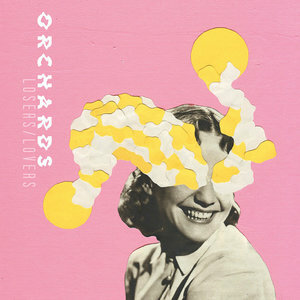 So, that brings us to Orchards, a Brighton-based poppy math rock band, who are offering the Losers/Lovers EP as their debut release. The band name evokes such bright, lush topography. It stirs up feelings of pleasant, windy afternoons spent in the comfort of so many trees. Yet, Orchards, the band, are not this. They're a little gray, but that is not necessarily a bad thing. Opening track, "Luv U 2", starts out with a defining feature of the band: twinkly bouncy guitar. Then the groups yells, "Whooo" in unison. Like the first bite of an apple, it all seems so sweet. The feeling doesn't last long though, as vocalist Lucy Evers works her way through a not-literal-enough yet not-abstract-either story of lost love and betrayal. This formula becomes the basic foundation of Orchards: bright, playful music with melodramatic lyrics performed by a charismatic front person. Yes, the music is playful and repeated listeners will be rewarded by it. Mid-album track, "Age of You" begins with a chunky guitar riff perfectly offset by animated drums, complete with wood block hits. The song slides into a bass-led groove before slowly building into a pop chorus that would sound quite natural on college radio. Orchards are not done yet, though. They add a nearly-psychedelic guitar workout in the middle before bringing back that chorus to roll out the ending. Other songs, like "Darling", with its endlessly echoed guitar, and "Peggy", with it's slickly robotic riffs, are just as fun as well. Vocally, Evers is just as playful. Truly, it's theatric. She's digging deep into her lungs to express herself, and it's admirable. The lyrics, though, are not fun. "Drama King" offers us this: "Bleeding gums / Pounding chest / I hate it when you're drunk / Let's give this a rest." Later, on "Honey" Evers sweetly croons the following: "Drown your sorrows, like your morals / You let a good thing slip away." Most of the album teeters on this tedium, where Evers moves through a story of a junk relationship. It can be a little grating if this is of no interest. That's where the gray creeps in. The title of the album is Losers/Lovers. So, It makes sense that Evers' characteristic topics are love lost, love gained, and love scorned. Talking about stand out track, "Double Vision", Evers states, "(it)... is very much about my struggle with depression and, yes, maybe not the best basis for a pop song…" As a listener, the thesis should become clearer here. Orchards are both the lovers and the losers. I mean, we all are. All relationships, whether romantic or otherwise, are full of peaks and valleys. Might as well put a bright backdrop on the whole thing.